Delivery van of the future? 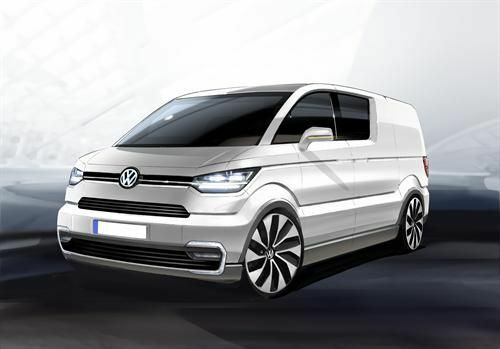 That is what VW is saying this electric concept van will be and they say they will prove it at the Geneva Motor Show this week. Electric delivery vans are nothing new. Ford has its Transit Connect Electric (available globally), Nissan its e-NV200 (available in several markets), and others have prototypes or test vehicles currently on the roads as well. Most of the big names in commercial vehicle sales, such as Navistar, Freightliner Custom Chassis Corp, and now small start-ups looking to get into the game have also jumped on board. It's obvious that electric, plug-in hybrid-electric, and similar concepts for the heavily contentious delivery van space are the future. This large commercial sector has a lot of potential for alternative powertrains because it is a relatively close-to-consumer market in terms of vehicle size - most are less than 16,000 pounds gross vehicle weight (GVW), many under 5,000 pounds - and the requirements are usually also low-need in terms of cargo weight capacity. Add to this the fact that the average daily mileage is predictable and relatively low (most fuel is spent idling or waiting in stop-and-go traffic) and that most of these vehicles have predictable usage cycles and it becomes obvious that electrics and similar range-limited technologies are a perfect fit. This is very much the case in Europe, where commercial delivery vehicles are increasingly moving to alternative power sources. Volkswagen plans to unveil its idea for an entry into this market at the Geneva Motor Show, which begins on March 5. The concept is called the e-Co-Motion and it is a mini-van-sized cargo van that runs on lithium-ion batteries and an electric motor. It's built for the delivery driver in mind, with a low door height for easy egress and entry, low cargo floor height, large cargo capacity (4.6 cubic meters) and an 800 kilogram payload capability. In all respects, its direct competition will likely be the Ford Transit Connect, which has very similar specs. Unlike the Ford, however, this VW concept also allows for cargo box options such as passenger shuttle, refrigerated box, platform (flat bed), etc. It will also be a dedicated electric vehicle rather than a shared platform as the Transit Connect Electric is. The concept is not being touted as a production-ready offering, with only the attached rendering having been released thus far, but by all indications, VW will have a physical concept on display at the show.